Lean cubes of pork are perfect for threading on skewers for grilling. While they are cooking you have time to make the simple peanut and coconut sauce which, although spicy, is not overpowering and is enjoyed by children and adults alike - perfect for a family supper. As an alternative to our free range diced pork, you could use pre-packed British diced pork. In a bowl, mix together the marinade ingredients. Add the pork and turn to coat thoroughly in the marinade. Cover and leave in the refrigerator for 1 hour. Thread the cubes of pork on skewers and grill, either on a ridged grill pan or under a preheated grill for 10-15 minutes, turning frequently until thoroughly cooked and browned on the outside. To make the sauce, place all the remaining ingredients into a saucepan and heat gently, stirring, to form a smooth sauce. Serve with the kebabs on a bed of rice with Waitrose Mixed Salad. Mini satays make a popular cocktail snack. Cut the pork into smaller cubes and marinate as above. Arrange the cubes in a grill pan or grill, turning frequently for 8-10 minutes. 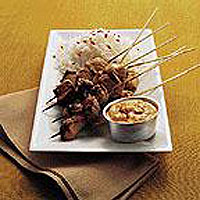 Spear one or two cubes onto cocktail sticks and arrange on a serving platter around a bowl of satay sauce for dipping. Note: This recipe contains nuts.